Yeah, the Gryfe’s obsession continues. The bagels, they’re unbeatable. But have I mentioned the pizzas? The little, six-inch round, plain cheese pizzas made from the very same bagel dough, a (very) little sauce, and a sprinkling of cheese? They come in bags of six, fresh from the ovens, and when you’re 10 or so and you pick up a bag at the bakery, you’re lucky to have four left by the time you make it the two blocks back to the house. 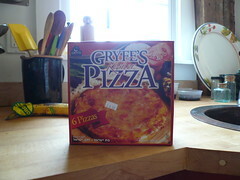 I spent a part of every summer until I was about 17 in Toronto, and most of those summer days, I ate one or two Gryfe’s pizzas for my lunch. If we were lunching in, my grandmother took a couple out of the freezer, warmed them in the toaster oven, and served them to me on rough, brown paper towels. 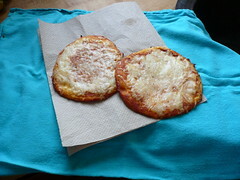 The pizzas were so hot I could barely hold them, but I could still eat one in about three minutes flat. If we were dining out (most days, this meant lunch at the Glen Shields Country Club, where my sister and I swam all day and my grandmother and her friends sunned, talked, and played mah jong), I would eat them room temperature, right out of the bag, poolside. My uncles derided me for my love of these so-called pizzas. I didn’t care. I knew what real pizza was (heck, I lived in Chicago in those days) and I knew these weren’t “real”, but they were beyond that for me. A perfect taste. A taste that still conjures carefree summer days. Which brings me back to the present. While browsing the Gryfe’s web site the other month, I noticed that they were selling some of their baked goods in other stores, including a few in the States. Mostly, they were selling muffins (never tried them, maybe never will), but the web site also said they were selling FROZEN PIZZAS at, among other places, The Butcherie, in Brookline, MA. The Butcherie is a kosher grocery store, not all that far from where my sister lives, so you can bet we made a little visit when we were last in Boston. Did they have them? Oh, you bet they did, and now, so do I.
I’ll admit right away that they don’t taste exactly the same as they do right from the store, but nothing ever could. They do, however, taste much better than the ones I’ve smuggled across the border and frozen myself. In fact, these taste darn good – almost as good as having one right from my grandmother’s fridge or freezer. Six come in a box. Amazingly, I still have four left. This is because, unlike some sisters I have, I don’t live close to The Butcherie and I have to conserve my pizzas. As if to rub salt in the wound, my sister recently reported that her local Whole Foods is now selling these pizzas: UNfrozen. Well, we have a beautiful view. We can’t have everything.